GPS navigation and location based services (LBS) provider MapmyIndia has launched yet another navi-tainment (navigation+entertainment) device in the Indian market. 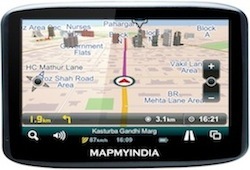 The device, called MapmyIndia Zx350 navigator, comes with a 5 inch screen and will be available for a price of Rs 15,990. According to the company, it is the only navigator in India with house level data and industry/government validated maps. In terms of specifications, the device has a 5 inch LCD touchscreen that offers a wide map-view while navigating. The internal memory of the device is 2GB, which can be further expanded an additional 8GB with a SD card. Apart from English, users can also use the device in Hindi. The Zx 350 navigator is powered by MapmyIndia's latest maps and offers house-level maps for 50 cities, 3D landmarks and 2D building footprints across 46 cities, over 10.33 million places, and street-level maps for 4,787 cities connected via 1.90 million km of highway and road network. According to the company, the device also comes with many functional features. For example, it can be used as a reverse camera screen, or be paired with a smartphone (via Bluetooth) to enable users to make and take calls hands-free. It comes with built in audio speakers and can also be paired with car AV system. The device can also double up as a music player, movie player, photo album and eBook reader. Then there is reverse routing- allows users to change the start and the end location; audible lane guidance available without text to speech (TTS); built in FM transmitter; and speed limit warning (in the form of audio-visual signs)- warns the driver if the speed limit is crossed. The company is also offering a number of accessories with the device that includes a car mount, wall charger, car charger and USB cable. Delhi-based MapmyIndia offers digital maps and data, GPS navigation and tracking devices, location apps and enterprise geographic information system (GIS) solutions. Its product range includes portable GPS navigator devices, in-dash navi-tainment systems, mobile apps and printed maps & books, among others. The company is backed by a host of private equity firms such as Qualcomm Ventures, Kleiner Perkins Caufield & Byers (KPCB), Sherpalo Ventures, Nexus Venture Partners and Zenrin Co Ltd. In June this year, the company expanded its product range by launching Trailblazer 2 for Rs 16,990. But unlike its predecessors, which mainly target four-wheelers, this one has been especially designed for bikes and comes with a 3.5 inch touchscreen display. It also includes multimedia features like music, movies and photos on the go (although we can't imagine anyone actually watching a movie while driving a bike). Early this month, the company also launched has launched Explore, a social navigation app that enables its users to find millions of useful places of interest like ATMs, restaurants, petrol pumps, and hospitals, etc. around them. Other navigation devices providers in the country include Garmin Corporation (a part of Garmin Ltd) and Dutch navigation service provider TomTom, among others. Last month, TomTom, which entered the Indian market in September 2011, strengthened its foothold in the country by updating its maps further and expanding to around 7,200-plus cities and towns for its VIA Series of portable navigation devices. The company also upgraded its MyTomTom mobile app for faster map downloads.